Film (Feature) Candid Carmen and Co. I'm the editor you're looking for! 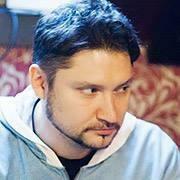 My name is Dmitry, I'm an editor with 12+ years of experience for commercial agencies, television and film. Scripted, shorts, commercials, branded. I'm a creative storyteller with a strong understanding of long-form, short-form and ultra-short-form content. Master of principles of editing, pacing and storytelling with a good eye for composition and aesthetics. I'm fast, reliable, problem-solving (both technical and creative), positive, self-motivated individual able to take direction and work collaboratively. Extremely comfortable person to work with. Team player. A charming dude. Expert in Avid Media Composer, Final Cut Pro, Adobe Premiere, DaVinci Resolve, LightWorks with a solid understanding of After Effects, Motion, Fusion, as well as Photoshop and Illustrator. Color Correction in latest DaVinci Resolve Studio. Also can do titles design and animation. available on request from BuzzFeed, HDF, Apple, Adobe, Avid, etc.